You are at:Home»Science and technology»What’s your reality? Ethan Worthington takes you into a whole new world at Holodeck Virtual Reality in Langley. The lunar eclipse aired January 20th and its show inspired genuine awe as the Earth’s shadow covered the moon and turned it reddish brown. Reality can’t get any better, right? 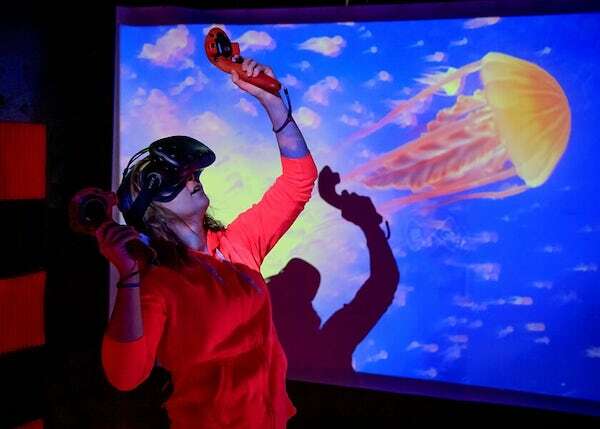 At Ethan Worthington’s Holodeck Virtual Reality lounge in Langley, one may visit Mars and hang out with the Rover, swim with giant jellyfish digitally scaled to look like the real thing, or hone archery skills against attacking hordes. 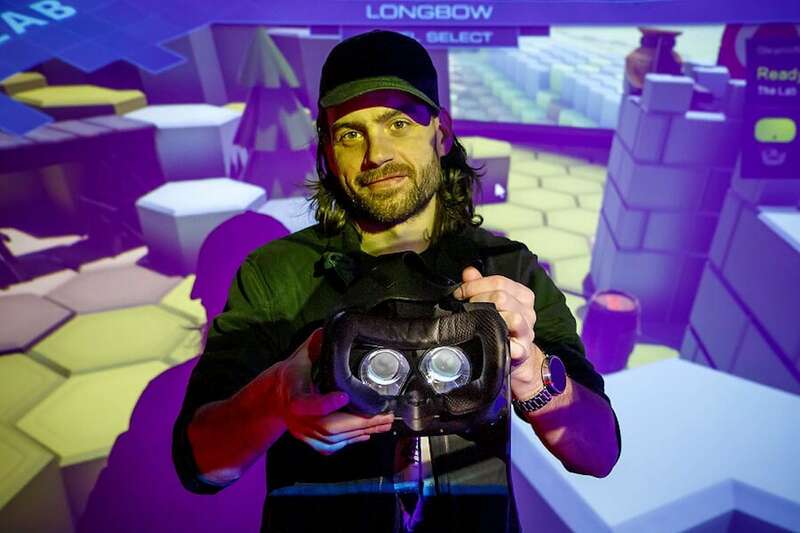 Daniel Algeo lives nearby and stopped by on a Saturday morning to virtually shoot unlimited arrows at hordes attacking his castle in the VR gameplay, The Lab-Longbow. Algeo worked for years in flight engineering with the FAA and is now pursuing a master’s in psychology. VR games present a challenge and escape between his studies. After initially seeking Worthington’s help in upgrading his aging home computer, Algeo learned about VR and had his new tekkie friend install a system at home. With a simulated cockpit and flight controls he’s off and flying. He said he ‘drove’ a car on the Amalfi coast about a month ago, which he described as an incredible experience. 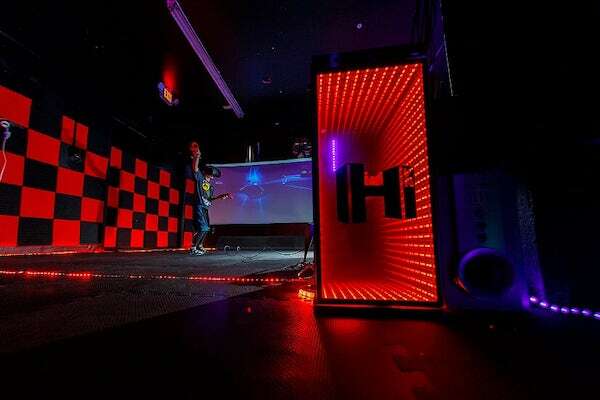 Holodeck Virtual Reality shares space in Tim Leonard’s Machine SHOP arcade on 2nd Street. It’s a fun hangout where folks play pinball, host open mike night and enjoy snacks at the cafe. A couple of years ago Worthington invited Leonard to check VR out and from then on, it’s been a part of the arcade. Virtual reality is a simulated experience created by computers and its origins date back to the 1960s. The technology is used for flight simulation, surgery instruction, creation of 3D models, and nowadays, is limited only by one’s imagination. Worthington has found his niche as a wizard of this technology. An Islander most of his life, Worthington in his 30s, said he’s enjoyed the virtual world for as long as he can remember. With experience in 3D modeling, printing and design, and building custom computers, he now brings virtual reality experience to the little seaside village of Langley. 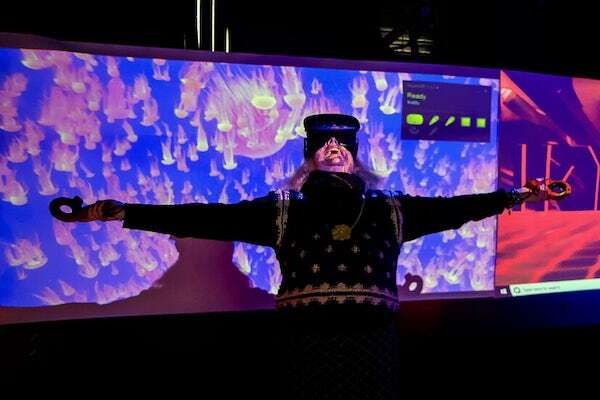 Author Kate Poss gets her first taste of Virtual Reality as she is immersed in an ocean of jellies. 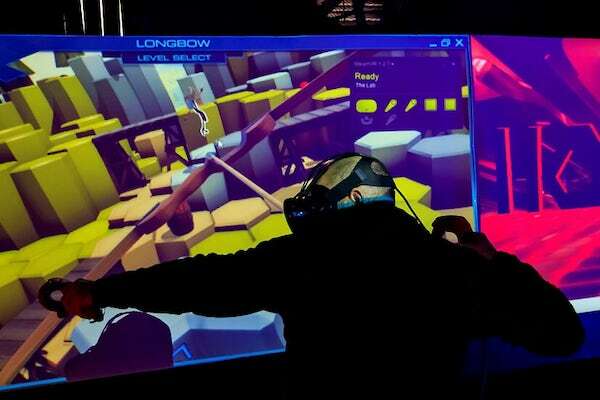 Longbow, which Algeo likes to play, along with Beat Saber, a 2018 virtual reality rhythm game, involving slashing blocks to musical beats, are popular games at Holodeck Virtual Reality. Worthington is a fan of Star Trek and the black room with white grids one sees in the VR headset are inspired by the series’ virtual reality rooms. In Star Trek characters engage in a more highly evolved digital sensory experience set in the 24th Century. Worthington predicts the industry will increase quality of experience over the next decade and beyond. Even now, he says, with games, like Superhot, described online as ‘elegantly brutal,’ the experience is so real one’s reflexes react to the intense imagery of being shot at by bad guys. Time can be controlled or slowed as in the film, The Matrix, so that one can learn how to dodge virtual bullets; if not, experience what it looks like to be shot. It is an all ages parents’ permitted game with a height restriction. Games for those 18 years and older, Worthington says, are in a genre of zombie/horror games. The padded walls he installed cushion players experiencing the fight or flight reflex while immersed in these intense virtual realities. These days Worthington says couples may come in and work out their tensions through virtual boxing. Families and friends visit the Rec Room, a multi-player experience where they ‘shoot’ paintball guns, visit dungeons, or travel the world—maybe dropping in to visit Egyptian tombs. Erin O’Connor works at the Machine SHOP and has, on occasion, assisted Ethan. Erin O’Connor, a young mom who works at the Machine SHOP, has helped Worthington in the past and is learning the tools of simulated experience. Her four-year-old daughter Ellie Callahan looks forward to when she’s seven or so and the headset fits her, because it’s too big to wear now. “It’s awesome. I love VR,” Erin said. Worthington licenses the games and programs through STEAM, a VR tracking company in Bellevue. He adds new content and looks forward to sharing new releases. 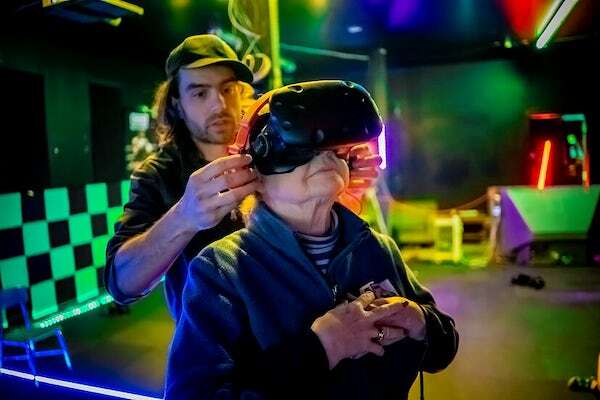 Yet, while Worthington guides hundreds through virtual reality voyages, he remains a regular guy with a beautiful toddler daughter named Rhea, a musical partner named Bekah and her young son Cooper. Alison Donham and her son Arthur walked in to play hei favorite game, Raw Data. Touted as the ‘ultimate VR experience,’ Donham says playing the game with her son helps her access her other self. “I become a sword-wielding, Ninja robot-warrior woman,” she said. Arthur’s favorite is Beat Saber. “I almost got the highest score,” he said. Great article! We (my family) absolutely LOVE Holodeck VR and Ethan is the perfect host/trainer. Im consistently impresssed with his ability to pick games for different people and explain VR, the games, plus give instructions at each persons individual level of understanding….often dealing with four guests in headsets at the same time! I’ve never been a gamer and spend most of my time outdoors…but since the first time Ethan let me demo at the machine shop, I have been hooked. VR is amazingly therapeutic, entertaining, and a great way to get your cardio in 😉 You can escape into another world or bond with family on a joint mission – endless fun, uses, possibilities. I highly recommend giving VR a try, and there’s no better place to do so than at Holodeck VR (the places in town pale in comparison!). It’s truly an experience that anyone will enjoy.